This year’s only international corps touring in DCI competition – Jubal from Dordrecht, the Netherlands – is celebrating its 100th anniversary today, April 11. Some of the other highlights of the anniversary celebrations are the release of a 280+ pages hard cover history book, a special anniversary CD and DVD with never previously published recordings and film material, a reunion and reception and an anniversary show event in July. The corps will feature brand-new uniforms this summer. Today there is a sponsored run (100 kilometers) for the charity fund KIKA (Kids Cancer free) and a commemorative celebration at the Dordrecht church tonight, where several members and alumni will be inducted in the Jubal Hall of Fame. 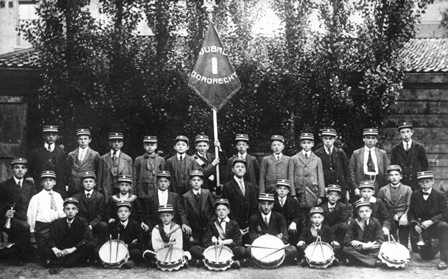 The corps was originally founded back in 1911 as a drum & fife corps after some boys playing fifes assisted a performing choir at the annual party of the local boy’s organization CJMV (Dutch equivalent of YMCA). After a year of much practice JUBAL first performed in the streets of their hometown, much to the pleasure of the inhabitants of Dordrecht – the oldest city in Holland. Through the years the corps won numerous National Fife Day titles. During the Second World War the Germans announced that Jubal was seen as a threat to the State and were therefore forbidden to assemble, perform, or rehearse. Since most members had kept and hidden their instruments at home, rehearsals continued in secret. Jubal was the very first corps outside the USA and Canada to switch to the G-bugles and introduced this type of brass instruments to the European crowds and amateur music scene. Reactions were diverse! Jubal has ever since been a trendsetter and pioneer in the European corps circuits. In the late 1970s the first official contests for drum & bugle corps were held in The Netherlands and England. With six national titles, three German Open titles, and three Drum Corps Europe titles to their name, Jubal is still one of the most successful corps in Europe. This year marks Jubal’s third tour in the USA, with performances at DCI shows in Ocean Springs (MS), Milton (FL), Atlanta (GA), Dayton (OH), Allentown (PA) and Erie (PA). The corps will then compete at the Open Class Championships in Michigan City and in Thursday’s prelims in Indianapolis. The fans at Lucas Oil stadium will be treated to a special 100th anniversary exhibition performance by Jubal, following the competitive segment of Friday’s semifinals event. Posted by News Editor on Monday, April 11th, 2011. 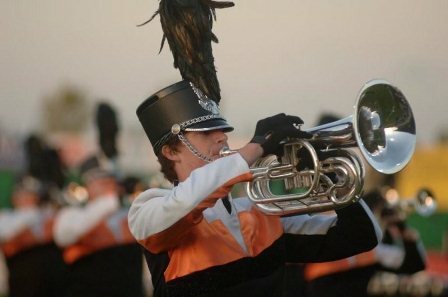 Filed under Current News, Drum Corps Netherlands, FrontPage Feature.